Put eggs and salt in a double boiler that is over smiling boiling water. 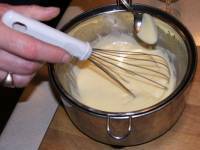 Whisk constantly until you see the eggs get frothy and starting to thicken slightly - about twice as thick. But you don't want to go as far as even beginning to get scrambled eggs. Gradually add chunks of hard cold butter, whisking constantly until the butter melts and the sauce is about the thickness you want. Add lemon juice, half a lemon at a time. Whisk and taste. Add more lemon if required. blog from OUR kitchen - artichokes? NOW?? 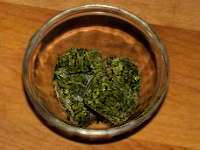 Heat oil in a large pot. Sauté onion and mushrooms til onions are soft and translucent and all the water has gone from mushrooms. Add celery, carrot, peppers, garlic and sauté about 5 minutes more. If you find that the sauce is too acidic tasting, add a pinch of baking soda. Not only does the acidity disappear, but you'll see some very cool foaming as the soda reacts with the acid in the tomatoes. If you are using pecans or almonds (we prefer pecans), toast the nuts in a frying pan or toaster oven. (The nuts are done just as you start to smell them.) Whir the nuts in a blender. Add the grated cheese and nuts to the basil mixture. Add cream if you want. If you're using pinenuts, leave them whole. Toast the pinenuts in a frying pan with a little bit of olive oil if you like and perhaps some more garlic. (Of course you can grind them if you want but pinenuts are SO wonderful whole that it seems a shame.) Add the grated cheese and pinenuts to the basil mixture. Toss with hot spaghettini, or better yet, serve as a garnish for grilled salmon steaks. It is also wonderful on pizza or in a sandwich. The first stage of pesto (without the nuts, etc) is also terrific as a garnish for grilled shrimp OR used as part of a simple vinaigrette for dressing a green salad. 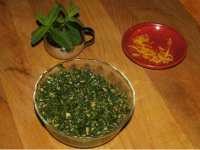 Wash and dry the mint, parsley, lemon verbena leaves well and put in a blender. Add oil, garlic. Blend til chopped very finely. Add ¾ of the pecans, salt, pepper, sugar and lemon juice and blend. Taste. If it is too acidic, add a little more sugar. Toss with hot spaghettini (or your favourite pasta), the rest of the pecans and grilled shrimp or chicken. If you use grilled chicken, use a dry rub before grilling it. Garnish with mint sprigs and lemon zest. Snow peas or snap peas go very well with this dish. We are absolutely addicted to "La Bomba" hot antipasto sauce made by Allessia. But it isn't always available, so we looked at the ingredient list and came up with a reasonable facsimile. Heat oil in a skillet. Sauté mushrooms, peppers, carrots, eggplant til soft and all the water has gone from mushrooms. Add chili flakes, artichoke hearts (get good quality ones), olives and heat through. Pour into a clean glass jar. Pour a little olive oil to cover. Allow the sauce to meld in the refrigerator for a couple of hours before serving. It can be stored in refrigerator for up to a month. I have only guessed at the measurements here. I usually just spoon things into a bowl until it looks right. Use your discretion. Mix it all together. Chill for a few hours. Serve with breaded fried fish. My sister sent me the recipe for this amazing sauce. Mix it all together. Chill for a few hours. Slather on freshly grilled steak. ^^7^^^7^%< ha  t? ...cholestral? ...what's that? This is excellent with a grilled vegetable salad, plenty of broccoli, mashed root vegetables and a robust red wine. This is good for any kind of meat. It is especially good on skinned chicken thighs served with long grain rice and green beans ... or on quail to be smoked and served on grilled vegetables. Finely chop the garlic and ginger. We use a mini food processor to do this. Stir all the ingredients into a small stainless steel pot. Bring to a boil and boil for 10 minutes, stirring now and again. It's good if the sauce thickens into syrup. Pour into a clean glass jar. It will store in refrigerator for several weeks. Place meat in a plastic bag. Pour in some teriaki sauce to cover meat. 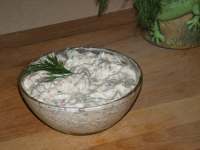 Marinate in refrigerator for at least 4 hours before grilling or smoking. This is my favourite barbecue sauce and good for any kind of meat. It is especially good on skinned chicken thighs. Melt butter in a large castiron pan (not aluminum!) and gently sauté onion, celery and garlic until soft (about 10 minutes). Add remaining ingredients and simmer slowly for about 30 minutes, stirring frequently to prevent burning. Let the sauce rest at least 1 hour so that flavours meld. Store covered in fridge. We were given a jar of Guava Jam for Christmas and found that we weren't eating it. T devised this marinade that is wonderful on grilled chicken - but I suspect is good for any kind of meat. The amount here is for one whole smallish chicken that has been butterflied. When the jar was finished, we switched to using some rather inferior peach jam that had been on sale for what seemed to be a ridiculously low price until we tasted it on toast. However, it works perfectly for making this marinade! Mix it all together and slather on chicken. Cover and refrigerate for a few hours before slow grilling over low heat.